SpamExperts Spam Filtering - Wissensdatenbank - QTH.com, Inc.
QTH.com employs multiple methods to block spam. These are outlined on our General Spam Filtering Assistance page. Some customers require an even better spam filtering and management system, so we have partnered with Spam Experts, a leader in the email security market, to offer their excellent anti-spam service to our customers for a very low monthly cost. How Much does Spam Experts cost? Protect your inbox from Spam, Viruses, Phishing, Harvesting and Malware. Sender and Recipient Whitelists and Blacklists that you control. Daily Report emailed to each mailbox user, showing quarantined mail (PDF or HTML). Non-spam messages can be released with one click. These reports can be enabled or disabled via our control panel. Daily Report can also be emailed to a manager, showing quarantined mail for ALL users. Again, non-spam messages can be released with one click. This report can also be enabled or disabled via our control panel. Searchable Logs of Email (90 days). View Management Reports to show the amount of messages blocked, quarantined and delivered. Configure File Extensions that you wish to automatically be blocked. Spam Experts Anti-Spam is just 99 cents per month for up to 10 mailboxes per domain name, or $1.99 per month for 11+ mailboxes per domain name. This cost is per-domain, which means that if you have 6 mailboxes with one domain, and 4 mailboxes with another domain, you'd need to purchase two of the 99 cent packages (total cost $1.98 per month), even though you aren't exceeding the 10 mailbox limit, because you are using two different domains. There is a two-month FREE TRIAL available. Just Contact Us and let us know which domain you would like us to add Spam Experts to, and we'll set it up for you. Log into your billing account at https://hosting.qth.com. Click Hosting Services then My Hosting Accounts. Click the Manage button next to the hosting account you wish to add SpamExperts to. On the LEFT menu, choose Upgrade/Downgrade Options. Next to Spam Filtering, you can select the SpamExperts 1-10 Mailboxes option ($0.99/mo) or SpamExperts 11+ Mailboxes ($1.99/mo), then click Continue. Our billing system will automatically calculate the extra fee, and pro-rate it for the balance of your current hosting agreement timeframe. Then checkout and pay by Credit Card, PayPal, or mail a Check. NOTE: After placing the order, please be patient as we process the order and configure your domain. This can take a few hours. After your domain is configured for SpamExperts, you will receive an email to let you know it is ready. At that time, you can log into the SpamExperts control panel. NOTE: It may take 4 to 24 hours after we send you the "ready" email for all mail to begin being filtered by SpamExperts. After 24 hours, you should really notice the difference in the level of spam and other unwanted email reaching your inbox. If you have any difficulty with the ordering process, just Contact Us and we'll take care of it for you. Log into the SpamExperts "SpamPanel"
This will present a list of your domains. Click on the Login link besides your domain name in order to open the SpamExperts control panel for that domain. 2) Login Directly into the SpamPanel. This is the only way for end users (non-Administrators) to login and view/set their individual spam filtering settings. Login at https://spamlogin.com/. First-time visitors will want to click "Retrieve log-in link", where they will enter their email address and Submit. They will receive instructions for setting a personal password. The first thing we suggest configuring is the Daily Spam Quarantine Reports -- now known as Protection Reports. This will send each of your mailbox users a daily email, in either PDF or HTML format, of all email that has been quarantined. Users can check this email daily for any messages that should NOT have been blocked, and they can release the emails for immediate delivery with a click of the mouse. To enable the Daily "Protection Report" (Daily Spam Quarantine Report) for EVERY user, automatically, just click "Protection Report - Mailbox" from the left-side menu, then click "Enable" next to "Automatically activate for all recipients". As the system starts to learn your active users, you can edit the Format (PDF or HTML). Alternatively, you can just add individual users by clicking the "Add a recipient" link, or by uploading a CSV file of email addresses by using the "Upload CSV File" link. PLEASE NOTE: If you are using the cPanel "Default Address" email feature where everything @ yourdomain is automatically forwarded to you, do NOT click the ENABLE link to automatically activate the daily report for all users. The problem is that SpamExperts will show that every email address for your domain is valid, and potentially hundreds of daily reports could be sent. If you use the "Default Address" email feature in cPanel, then manually add each email user that should get the daily report. 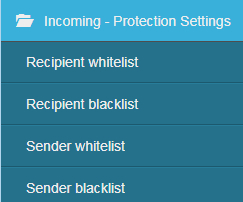 Use the Recipient Whitelist to basically stop all spam filtering for one of your email addresses. Use the Recipient Blacklist to block all mail sent to one of your email addresses. 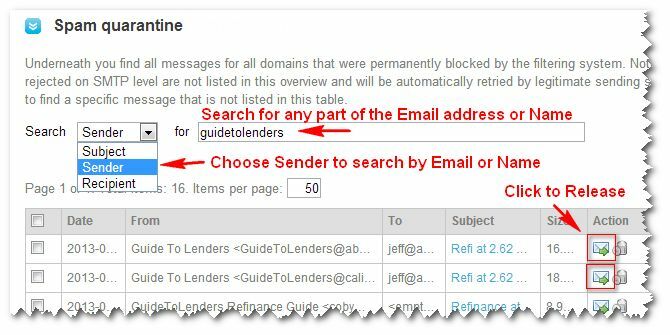 Use the Sender Whitelist to enter in email addresses and domain names that you want to never block. Use the Sender Blacklist to block all mail from certain email addresses and domain names. You may now search the Spam Quarantine by the Subject, Sender or Recipient. Usually you will search by Sender (i.e. the person that sent you the message). You can search by their email address or by their name. Partial searches are allowed. When you press enter, it will start searching. If you see any messages that are NOT spam, you can click the "envelope" icon and that message will be delivered to your inbox right away. This will also train the system to do a better job with similar messages in the future. You might also want to consider adding the sender to your Sender Whitelist so their messages will never be spam filtered again. There are many other options under the SpamPanel, such as Log Search, View Spam Quarantine, Blocked File Extensions, etc. These should be fairly straightforward to use. Feel free to look around. If you have questions or problems, feel free to Contact Us for assistance. What is MySQL? What is a Database? What is SQL?